We have finally returned home from picking Nathan up from Paul’s parents’ house. Everything went smoothly. Nathan hardly fussed at all… and Paul’s mom got to experience a Poop Bomb. That’s right. Nathan pooped all over the place. EVERYWHERE. He couldn’t poop just a little bit. He had to let his bowels release what seemed like massive stores of stinkified, smelly poop. And Paul’s mom had to witness it. Then clean it all up. She said he had pooped twice in a row. The first time was a pretty decent amount, complete with face-scrunching and Nathan Grunts. She changed his diaper and was in the process of putting the nice, clean diaper on him when a volcano of poop poured into the clean diaper. She said it was like a Play-Dough Factory. You know those Play-Dough toys where you put a ball of Play-Dough in the machine, press a lever, and tons of Play-Dough flows from the opening? That was like Nathan. The poop just kept coming. And coming. And coming. Nathan filled up two whole diapers full of poop. It got all over the place, and all over him. He was a fountain of poop. Never ending poop. She said by the time she went to bed, she was wearing bananas, prunes, sweet potatos, milk, and… yes, you guessed it, poop. So other than Nathan pooping everywhere, his visit with his doting grandparents was wonderful. And so was the date Paul and I went on. I posted yesterday when we briefly stopped by the house for me to pump that we met up with our friends and devoured some delicious hot wings. I LOVE hot wings. The spicier, the better. After that, we followed our tradition of playing a few games of pool. Paul and I realized exactly how old we are when we left to return home at 10:30. That’s right, I said TEN THIRTY. I remember when we could stay out until 3 or 4 in the morning, no problem. But not lately. Our eyes were becoming heavy, our bones were beginning to creak, and I’m pretty sure I was sprouting a leaf or two from my head because I was about to morph into a pumpkin. We were asleep by midnight. But you know what? We had a blast! I love that man so much, and it felt wonderful to be husband and wife rather than Mommy and Daddy for a night. It was great flirting with each other and staring at each other’s butts when we bent over to play pool. We indulged ourselves in greasy bar food like fried mushrooms, clam strips, and a Philly cheese steak with fries. I’m pretty sure I gained another 10 pounds. But you know what? It was worth it because we loved every minute of it. This morning, we slept in later than we have in eight months. I only woke up once last night, and that was because I was thinking about Nathan. When we finally rolled out of bed, Paul cooked a mouth-watering breakfast of fried eggs, bacon, and French toast, which I scarfed down with a glass of sweet tea before we left to pick up Nathan. 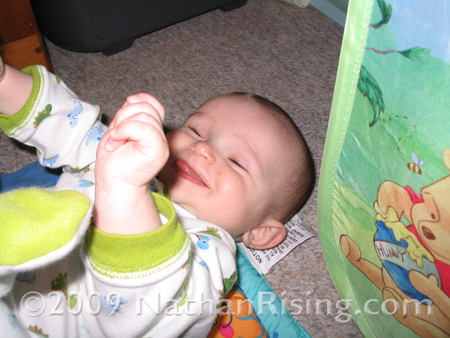 Nathan was extremely happy to be back home. He plastered my face with wet, slobbery kisses and filled the house with his laughter. He was in such great spirits that I was reluctant to put him to bed. As you can see in the video below, he was a very happy little guy! We all had a wonderful time last night. Paul and I loved our date, Nathan enjoyed being with his grandparents, and the grandparents had a lot of fun with Nathan. I can’t wait to do it again!